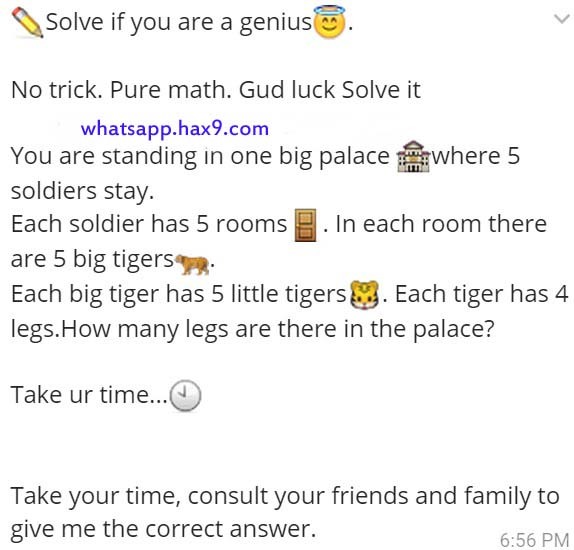 ✏ Solve if you are a genius 😇. You are standing in one big palace 🏤 where 5 soldiers stay. Each soldier has 5 rooms 🚪. In each room there are 5 big tigers 🐅. Each big tiger has 5 little tigers 🐯. Each tiger has 4 legs.How many legs are there in the palace? Take your time, consult your friends and family to give me the correct answer.